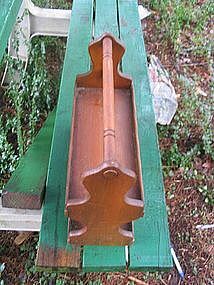 Two tiered vintage wooden spice caddy with handle. The angle of the rack in the photo, does not allow you to see the bottom shelf. It is approximately 12 x 13 1/2 x 5 1/4 inches. I always like the portability of these tray, because I never liked to keep my spice rack above the stove because of cooking residue. I could keep this one on the cabinet top or inside the cabinet and move it over when I needed my spices. I've had it packed away for many years and have not tried to "pretty" it up for sale. It is in a tight and secure condition with no splits or damage to the wood. However, the finish shows some age related wear. Additional photos or info by email. I need your zip code to calculate the postage.